Pune, Nov 23: A terrific second-half display from youngster Lallianzuala Chhangte helped Delhi Dynamos register an impressive 3-2 victory over FC Pune City in their Indian Super League opener at the Shree Shiv Chhatrapati Sports Complex Stadium here on Wednesday. The 20-year-old from Mizoram created the first goal for Delhi before netting one for himself on a memorable evening. 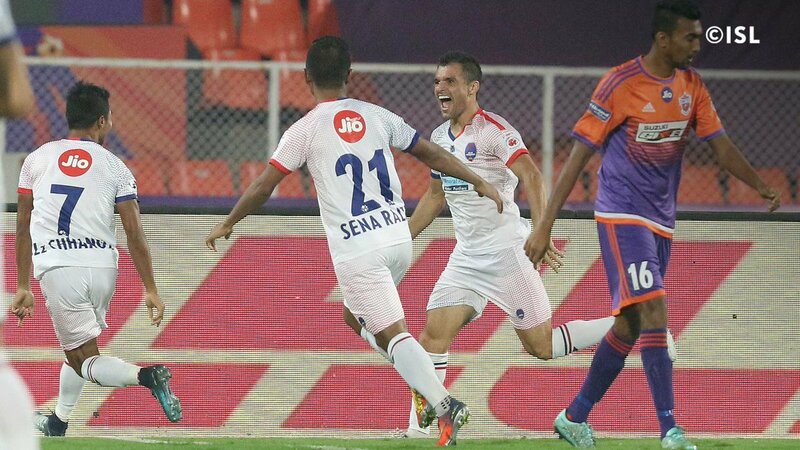 Paulo Henrique Dias Da Cruz, Chhangte and Matias Mirabaje scored three second-half goals for the winners, while Emiliano Alfaro and Marcos Tebar were on the scoresheet for Pune City. After the opening 45 minutes saw Delhi Dynamos dominate possession without creating any opportunities, the game turned on its head in the second half. It took Delhi only a minute in the second half to open their account. After some hard work down the left flank, Chhangte sent in a delightful cross at the near post where Da Cruz did the rest to hand Delhi the lead. Eight minutes later, Chhangte found himself clear on goal after Delhi defender Gurtej Singh failed to clear the ball to safety. Chhangte coolly lifted the ball over onrushing FC Pune City goalkeeper Kamaljit Singh to double the advantage. Delhi looked in complete control of the game and looked more likely to score. And they did in the most spectacular way in the 65th minute. After working a short corner, Mirabaje unleashed a curling left-footer from the edge of the box that found the top corner of the nets. After Mirabaje's goal, the match looked done and dusted. However, just two minutes later, Pune pulled one back. Sarthak Golui's cross found Emiliano Alfaro just outside the box, and the Uruguayan smashed a low shot past Delhi goalkeeper Albino Gomes. Buoyed by the goal, Pune pushed for a second goal but Delhi defended resolutely. The hosts eventually reduced the deficit to just one through Marcos Tebar in the third minute of added time but it proved too little too late.